Straw erosion control netting blankets are the perfect option for any location dealing with low flows, slight slopes or temporary erosion control requirements. Often implemented in projects involving landscaping, bank restoration or erosion control, these blankets provide the ideal blend of strength and soil stabilization. Erosion Control Accessories are an often required component for any site using blankets, matting, or logs. Ask about our erosion control options to help secure your site. Choosing the right straw erosion blanket is often dependent on the location where it will be used and the amount of water flow in the area. In general, double nets blankets will typically offer more strength for steeper locations or areas with an increased flow. The following chart can be used as a guideline to determining the best option for your location. In addition to single and double net options, these straw erosion control netting blankets will also feature either a standard or rapid degrade netting. 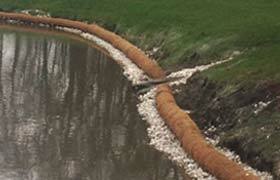 For these and other erosion control options, view other options for Soil Erosion Control.